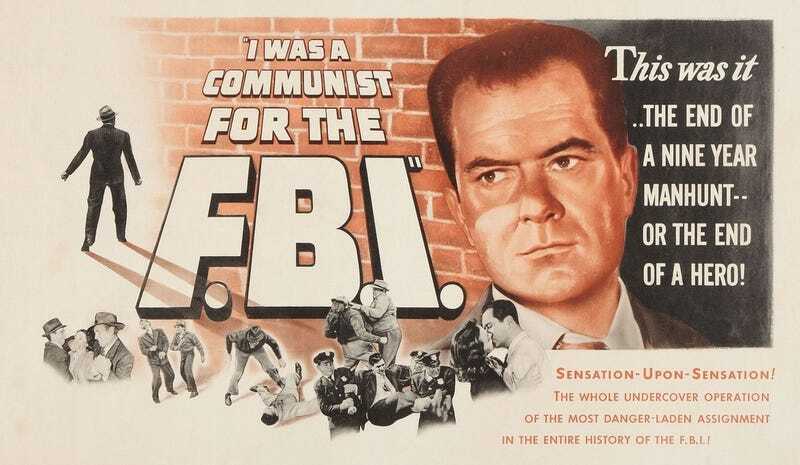 During his great Communist witch hunt of the 1940s and 50s, Congressman Joseph McCarthy infamously turned his eye to Hollywood. McCarthy sought to purge Tinseltown of any possible speck of pinko influence. And an organization of conservative activists known as the Motion Picture Alliance for the Preservation of American Ideals was more than happy to name names of alleged Communists working in Hollywood and provide any other assistance necessary. They even had Rand write up a guide for the movie industry. Titled the “Screen Guide for Americans,” the pamphlet was distributed in 1947. Michigan State University has a copy of the guide, which advises producers on everything from spotting Communist subversion in their writers to the practical advice of how to avoid celebrating “the common man.” As Rand explains, glorifying “the common man” is “Communist doctrine” which “preaches the reign of mediocrity.” I’m not making this stuff up, I swear. Below I’ve pulled some of the most interesting quotes from the document. The emphasis in bold is entirely Rand’s. The purpose of the Communists in Hollywood is not the production of political movies openly advocating Communism. Their purpose is to corrupt our moral premises by corrupting non-political movies—by introducing small, casual bits of propaganda into innocent stories — thus making people absorb the basic premises of Collectivism by indirection and implication. Don’t preach the superiority of public ownership as such over private ownership. Don’t preach or imply that all publicly-owned projects are noble, humanitarian undertakings by grace of the mere fact that they are publicly-owned—while preaching, at same time, that private property or the defense of private property rights is the expression of some sort of vicious greed, of anti-social selfishness or evil. While motion pictures have a strict code that forbids us to offend or insult any group or nation—while we dare not present in an unfavorable light the tiniest Balkan kingdom—we permit ourselves to smear and slander American businessmen in the most irresponsibly dishonest manner. It is true that there are vicious businessmen—just as there are vicious men in any other class or profession. But we have been practising an outrageous kind of double standard: we do not attack individual representatives of any other group, class or nation, in order not to imply an attack on the whole group; yet when we present individual businessmen as monsters, we claim that no reflection on the whole class of business men was intended. “The common man” is one of the worst slogans of Communism—and too many of us have fallen for it, without thinking. Under the American system, all men are equal before the law. Therefore, if anyone is classified as “common”—he can be called “common” only in regard to his personal qualities. It then means that he has no outstanding abilities, no outstanding virtues, no outstanding intelligence. Is that an object of glorification? In the Communist doctrine, it is. Communism preaches the reign of mediocrity, the destruction of all individuality and all personal distinction, the turning of men into “masses,” which means an undivided, undifferentiated, impersonal, average, common herd. In the American doctrine, no man is common. America is based on the ideal of man’s dignity and self- respect. Dignity and self-respect are impossible without a sense of personal achievement. When you defame success, you defame human dignity. America is the land of the self-made man. Say so on the screen. Only savages and Communists get rich by force—that is, by looting the property of others. It is a basic American principle that each man is free to work for his own benefit and to go as far as his ability will carry him; and his property is his—whether he has made one dollar or one million dollars. If the villain in your story happens to be rich—don’t permit lines of dialogue suggesting that he is the typical representative of a whole social class, the symbol of all the rich. Keep it clear in your mind and in your script that his villainy is due to his own personal character—not to his wealth or class. Don’t excuse depravity. Don’t drool over weaklings as conditioned “victims of circumstances” (or of “background” or of “society”) who “couldn’t help it.” You are actually providing an excuse and an alibi for the worst instincts in the weakest members of your audiences. Don’t tell people that man is a helpless, twisted, drooling, sniveling, neurotic weakling. Show the world an American kind of man, for a change. Don’t make every form of loneliness a sin, and every form of the herd spirit a virtue. Remember that America is the country of the pioneer, the non-conformist, the inventor, the originator, the innovator. Remember that all the great thinkers, artists, scientists were single, individual, independent men who stood alone, and discovered new directions of achievement—alone. Don’t let yourself be fooled when the Reds tell you that what they want to destroy are men like Hitler or Mussolini. What they want to destroy are men like Shakespeare, Chopin and Edison. Don’t discredit our courts by presenting them as corrupt. If you do that—you lead people to believe that they have no recourse except to violence, since peaceful justice cannot be obtained. It is true that there have been vicious Congressmen and judges, and politicians who have stolen elections, just as there are vicious men in any profession. But if you present them in a story, be sure to make it clear that you are criticizing particular men—not the system. The American system, as such, is the best ever devised in history. If some men do not live up to it—let us damn these men, not the system which they betray. There is no obligation on you to make political pictures—if you do not wish to take a strong stand. You are free to confine your work to good, honest, non-political movies. But there is a moral obligation on you to present the political ideas of Americanism strongly and honestly—if you undertake pictures with political themes. And when you make pictures with political themes and implications— DON’T hire Communists to write, direct or produce them. You cannot expect Communists to remain “neutral” and not to insert their own ideas into their work. Take them at their word, not ours. They have declared openly and repeatedly that their first obligation is to the Communist Party, that their first duty is to spread Party propaganda, and that their work in pictures is only a means to an end, the end being the Dictator- ship of the Proletariat. You had better believe them about their own stated intentions. Remember that Hitler, too, had stated openly that his aim was world conquest, but nobody believed him or took it seriously until it was too late. The section on glorifying depravity is particularly interesting given Rand’s own obsession with and glorification of serial killer William Edward Hickman. In the 1920s, after Hickman had killed and dismembered a 12-year-old girl, Rand wrote that the murderer was a “genuinely beautiful soul” who had “the true, innate psychology of a Superman.” But that’s a discussion for another time. The entire pamphlet is a fascinating artifact of the Cold War. It’s unclear precisely how many Hollywood producers received this pamphlet, let alone how many actually read it. But whether they read it or not, we certainly see the trend in over-correction by Hollywood in the 1950s, each producer attempting to prove he was more patriotic (read: anti-Communist) than the last. Rand has had an enduring legacy on American political thinking. But one area that remains to be studied thoroughly in the popular press is Rand’s direct and indirect influence on Hollywood. Curiously, as far as I can tell, she didn’t sign her name to this pamphlet. The only credit is given to The Motion Picture Alliance for the Preservation of American Ideals in Beverly Hills, California. Collective credit for the work of one woman? Sounds a lot like Communism to me.